It was a shack. Set in the middle of the woods, a full two leagues away from anything and anybody. A tiny ramshackle little hut, with a sign post out. It said that it was with Three Trees Trading Company. A boast, for something so small. But this wasn’t one of their myriad shops that dotted the landscape. Even for such a remote location it was less travelled than one would think, with no goods to speak of. And still they came. 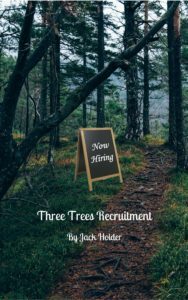 Three Trees was hiring today. They were not seen as the best and brightest. Many times, this horde of perspectives was not seen. Ruffians, refugees, those who fell into the cracks of society. Unwashed, undesired, and yet unique. They had travelled here. Twelve dozen, not strong, but from all around. From the forest holes to across the seas, they had come. There was work. They had all heard the rumors. Three Trees was just a company with no soul. It was possibly demonic. Definitely was ruthless. Give it a chance, and this company would steal you away. But they were the only ones giving these people a chance. There he was, one of the minor executives. Seated at a desk just outside the door, chair and table nestled in the pine needles. He did not look up for a moment, making a notation on his paper with a fine quill. The executive looked up. And smiled. He was a warm heart, a welcome change to many of the worthless. He looked at each in turn, nodding as if to say thank you for honoring us with your presence. Some would have killed just for that look. They all signed. What else was there to do but sign? This was what they were here for. As for the warnings, well. What did they care about their lives right now? What had they done with them? The boy looked up at the executive. The boy ducked behind the desk. Laughing, the executive sat back in his seat. The boy poked his head up over the desk. A little scrag of nine years old, so small he looked closer to six. His rags just made him look sad. His stare, though, was straight ahead and just inquisitive. He waved the quill through the air. In a flash of sparks an apple sailed above the boy’s head. He snatched it out of the air, and was devouring it before the quill finished its motion. “I thought so.” The man searched through his papers. He frowned, and searched harder. He knew he had one left, at least. There was more than was to be expected, but still…aha! There it was. The boy signed the paper, still holding the apple in his free hand while he munched. “Well, there you go.” The executive nodded for the door. The boy stepped inside. And stopped, confused. The outside of the hut was very much like a hut. Inside, it opened to a massive cavern. Obstacles, boulders and stalactites scattered across the sightlines. Men and women shied away from cliffs that dropped away into darkness. The trainer was a woman this time. Looking to be in her late fifties, she leaned on a desk about twenty yards away from the entrance. Short, graying hair hung about her ears, but there were no wrinkles to speak of. Like her colleague outside, the desk was a simple, wooden affair. A couple of lampposts flickered on either side of the woman. The woman stuck her thumb behind her into the darkness. The horde milled about, unsure about what was going on. The woman straightened, furious. Run. Run and just keep on running into the black. Sight was not needed, the only direction you need to know is straight. If you hit the back, start feeling for a handle. Seemed simple enough. The boy raced ahead, outpacing the weak and infirm. There was a fleeting thought to help them across. But Three Trees was not going to award points for charity. The only thing he could do was keep moving. A scream brought him screeching to a halt. Someone ahead stumbled, and fell. And kept falling, their voice echoing off the cave walls as they disappeared into the abyss. The boy reached his foot out, and found nothing but air. Around him were mutters and groans. Several outcries at the lack of fairness fell on deaf ears. Everyone knew that there was a solution. It might just not be one they could see. But, no, they could see it. The lampposts had flickered down to nothing. As their eyes adjusted to the dim light, there were gray pillars, rising up. There were paths, stretching one way and another. Ahead of the boy three women leapt across. They caught hold of a pillar, bracing against each other. The first scrambled up, standing at the precipice. The two left hanging looked in different directions, searching. One pointed to the left, and to there they leapt, one after another. Slowly, they slogged through. Others tried as well. The boy could hear screams of failure that petered off into nothing. He took backwards steps, and leapt forward. Jump, look, jump, look. Don’t think about it. Feel the excitement, let it guide to the next post towards freedom. He stood at the other end, watching a dozen or so race through the closing door. The boy stole one last glance, to the more than one hundred that stood at the edge of the abyss. The ones left behind strained forward, hoping for one measure of mercy, or a last chance for them. The boy slipped in before the door closed. Those who couldn’t manage to make it across were forgotten. The remaining applicants looked around, confused. Torches had flared to life. It was no longer a cave, but a lecture hall. Extending a hundred feet above them, with rows upon rows of desks centered upon the podium. A professor leapt up from behind the podium, and shook each applicant’s hand in turn. His eyes were bright, despite the old age and bent posture. He smiled warmly to each of them, measuring each in turn. “Yes, yes, let me take a look at…there are definitely more than I was told about. No matter because you are here and this is wonderful you are all very fast and nimble but speed isn’t everything onto the test!” He finished in a continuous rush of words. There was a pregnant moment as the remaining men and women tried to fully process what he said. Finally a young woman raised a hand. The professor pulled a scroll out from the folds of his robe. He let one end fall from his outstretched hand to the floor. The boy held the scroll with dread. Rolled up, it was thicker than his arm. He might have been able to run and leap, but what had he learned? The professor turned the hourglass over. The sand trickled down without mercy. The boy could barely understand what was before him. He hadn’t even truly learned how to read, and the scratches on this parchment were indecipherable. He had reached all the way across the abyss for a test? How was this fair? A man screamed. A trap door opened up beneath him, sliding his body away. The boy’s head hit the scroll. He was going to fail here. Go back to nowhere to do nothing. Just disappear into oblivion. No chance to go on, or rise above. There was nothing. The boy stood up, keeping low and beneath the desks. Down at the podium, the professor’s face was livid. His quarry cowered, but held firm. The boy inched his way up to the top of the stairs. He had seen something. Far below the professor was trying to keep his patience. There it was, at the top. An exit, back into the darkness. The boy didn’t hesitate in his escape. This wasn’t true darkness. There was some semblance of light for the boy, but from what source he did not know. Perhaps it was the mist curling around him. He didn’t know whether to be proud or terrified of his actions. Was he breaking some sort of rules? Was he supposed to fail at the test, like he was certain to do? As the mist grew thicker, he wrapped his arms around him for warmth and comfort. The boy darted towards a wall. He shrunk down, eyes wide and looking for the source of the sound. Something slithered through the mists. Its body trailed past the boy’s leg, scaled and crimson. Whatever it was, it was large, and powerful. A naga rose out of the mists. A woman from the waist up, clad in a green top that hugged her curves, sharing a glimpse of bare skin and scales. Her body was tanned, with midnight hair that fell down to her midriff. Her bottom was a crimson tail, that moved in concert with her hips. Her eyes were yellow slits. A forked tongue tasted the air. With a smile, she turned to the boy. A leaf knife was held in her hand. The boy leapt forward, right at the naga’s throat. She twisted back, and he turned the leap into a roll. In a second he was on his feet, and jumped again. The woman turned towards him, knife slashing forward. He gripped her wrist, and wrenched the knife away before running back into the mists. The naga looked at her empty, throbbing hand. She chuckled. She leaned down to the ground. The mists enveloped her body as she slithered towards his scent. The boy crouched, staying away from the wall. He held the knife with purpose. It felt comfortable, right. He had never shied away from violence, but neither had he sought it out. Sometimes there just wasn’t a choice. Search for the sound. Wipe away the sound of mist settling on the stones. Past his own slow, silent breaths. To the slightest trail of scales upon the ground. There! Strike there! The boy’s hand struck down. The knife passed through scale, flesh, bone and struck the stone. The naga howled, he wrenched the knife out of her. His only defense, he could not lose it. And run, run! Racing back into the mists. He had to escape. This was a place of death, void of anything resembling goodness and compassion. Keep following the hallway. It will lead somewhere, maybe up to the surface. Somewhere he could run off to the woods. Find some good out of all this. And yet, he did not want to leave. He wanted to see this all through. He was determined now. And nothing would get in his way. Nothing. Not this wizard that stood in the center of the mists. It was hooded, stoic, and silent. The boy held the knife up, the wizard did not respond. The boy moved left, and right. The wizard stayed still. The boy made to walk past the figure. Perhaps it was just a statue. But the supposed statue followed his movements. And began to glow, golden light spilling out of that hood. The knife struck first. The boy stabbed towards the wizard. Nothing would stop him from finding out the truth. Nothing! The knife passed through mist. There were no robes, no figure. The boy was slashing through air. He had known what he had seen. He trusted his eyes, knew they weren’t fooled by some illusion or trick of the light. There had been someone there. “I’m not afraid of you!” He called out. No response. There was someone watching, he could feel it. But despite his searching eyes, they were nowhere to be found. Just keep going. Keep on going. Keep going until the hallways ended at a door. He tried the handle to find it unlocked. The torches within did not flare to life until the boy stepped over the threshold. It was a small room. Another door opposite him, the entire thing looked squished. There were bookshelves lining each side of the room, filled with scrolls, tomes and artifacts. And in the center was the executive, tapping a finger against his leg. Before the boy could widen his eyes, the executive was upon him. His grip was iron, and the knife was torn away. “You’ve been holding this the wrong way, and almost sliced yourself up more than Sssthinthia,” The executive muttered. “So much to learn.” He pocketed the knife, and walked over to the other door. He held it open, and looked at the boy. The boy thought about it. What was a homeless life worth anyways? He felt the knife placed back into his hands. “Good answer. Much better than you know.” The executive unlocked the door and nodded to the boy. The door opened up to a viewing room. Surrounded by glass, the two could see the entire complex, from the cave straight ahead, to the lecture hall and the labyrinthine hallways beyond. The trainer held conference with the three women, all four looking grim yet triumphant. The women didn’t even try to contain their glee. One showed her tears proudly, holding onto another with sheer exuberance. “I thought there was only one job?” The boy asked. The professor and young woman were once again in the midst of an argument. She was waving her contract high in the air, almost shouting, while the professor could barely contain his laughter. The other candidates had all left, leaving the masters at the desk. They each appraised the boy with new eyes. No one seemed disappointed. “You’re fast,” The trainer said. “You know both strengths and weaknesses.” The professor. “You are decisive.” The naga. “And you understand necessities.” The mage finished. The executive snapped his fingers. A bound man was brought before the boy. It was the candidate that had been caught cheating. He was gagged, bound in chains, helpless. But he could stare, and his eyes pleaded with the boy. “Does it matter?” The executive asked. “But you lack focus. Direction.” The trainer muttered. The executive waved them all off. He held the boy up, and stared, long and hard. The knife felt heavier. It wanted to do something. He wanted to do…what? The question was posed by one of them, but he couldn’t hear. What to do, what to do. He looked at the man. He was pathetic, a cheat. Worse than that, he was a caught cheat, a loser who couldn’t even steal victory. No one that stupid deserved anything in life. The boy had never killed before. His knife paused. What would it feel like? Would he change? How? The body was dragged away, as was the knife. It needed to be cleaned, and besides, it was possible that this wasn’t going to be the boy’s specialty. “Ok.” He felt tired. The entire day weighed upon his shoulders, causing a droop. The five asked if he wanted anything. He really just wanted to go to sleep. Eventually he nodded off, curled up around the blood. “Take care of the refuse.” The executive said. “I wasss just feeling famissshed,” The naga smacked her lips. “Let’s not be crude, darling.” The young man bundled up his new employee. He wiped the blood away from that face. He still looked innocent, despite everything they did. This was something to be cultivated. He had never personally groomed one of the Artistes. It was an arduous process, and failure meant death for trainers as well as the subject. The five had held off on selection just out of that fear. “So you think he’s the one?” The trainer asked. The man nodded. “We have a little one to raise. Our very own killer.